The 1960’s. It was the era of the Nixon/Kennedy debates, the Berlin Wall, the turbulence of civil rights, the Beatles, foreign espionage, the moon landing, and the emergence of a counterculture generation that believed that loving one another was preferable to committing acts of violence. Central to this latter mindset was the controversy of the Vietnam War and the decision of many able-bodied young men to avoid the U.S. draft by leaving the country. In debut author Kay Kendall’s new release, Desolation Row, her newlywed heroine not only finds herself married to such a man but also in jeopardy of losing him as a result of dire circumstances beyond the control of either of them. Q: Tell us how your journey as a writer began and what inspired you to embrace the mystery genre for your debut in the world of publishing. A: My favorite stories involve romantic suspense set against a backdrop of great turmoil and danger. Stories about World War II and the Cold War fill that bill for me. I wanted to write my own version of that kind of romantic suspense. 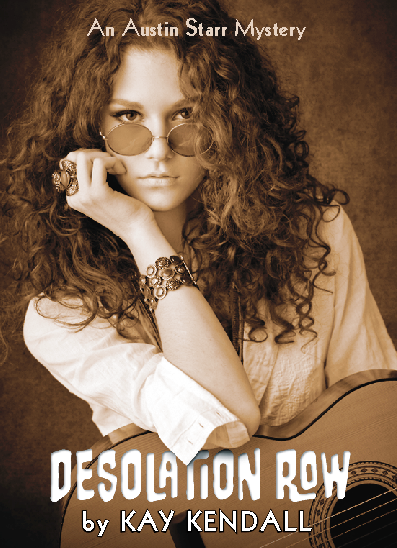 In the case of Desolation Row, a young woman from Texas marries her college sweetheart and goes off to Canada with him during the Vietnam War. Then her husband David is arrested and jailed for murdering the son of a United States Senator. Only the new bride, Austin Starr, believes he is innocent. Against all odds, she decides to rescue him, to prove that he was no killer. Q: Did you read a lot of mysteries when you were growing up? If so, who are some of the authors whose storytelling styles you most admired? A: I read every one of the Nancy Drew mysteries, just gobbled them up. I also read classic fairy tales that had an air of suspense to them. From there I leapt right on to the famous Cold War spy stories of John le Carré. In contrast, I read just one book in the series that featured Cherry Ames in various nursing professions. Not my cup of tea at all. Now that I am “all grown up,” I don’t even watch medical shows. They simply don’t interest me, whereas mysteries and suspense and spies sure do. Q: Who and what are you reading now? A: I’ve just begun to read Sue Grafton’s latest offering in her famous alphabet series that stars private eye Kinsey Milhone. This one is called W is for Wasted, so she doesn’t have many letters in the alphabet left to explore. I’m impressed by how much her mysteries have grown in complexity over the years. I heard her speak at a writers’ conference last month, and she is a hoot—besides being massively talented. Q: Does the title you chose for your new book – Desolation Row – have a particular meaning to you? A: All the titles of my Austin Starr mystery series will be taken from Bob Dylan songs. If you know the era, then you will recognize those titles and realize that the stories are set in the sixties. I had to make sure that any title I used was from a song that had been released by the time my story took place. Bob Dylan is so prolific a song writer that it is not hard to find an appropriate, evocative title. In the case of Desolation Row, the title captures Austin’s husband’s sense of desolation as he waits in a row of cells in prison. Q: Tell us about your female protagonist, Austin Starr, and the passions that drive her thoughts and actions. A: Austin is smart, a real bookworm, and loves history. She’s young and naïve and has been taught by her mother that the role of wife and mother is the only one that will bring fulfillment to a female. Austin is not sure this is true, but she goes along with it and, with that grounding, she feels she has to go to Canada with her husband, even though she does not want to leave Texas. Her husband is a political activist but she is not. Once David is jailed, only one thing counts for Austin—proving his innocence. After that, she hopes somehow, someway, to return home to Texas. That is an over-arching question to this series—will Austin ever return to the United States, which is her heart’s desire? Q: Is she modeled after a real person? A: Austin is a combination of traits that I see in my nearest, dearest, and longest-held friends. Q: If Hollywood came calling, who would you cast in the lead role and why? A: Because Austin Starr is only twenty-two years old in 1968, when Desolation Row takes place, the actress who plays her has to be quite young. She has to be able to be naïve and sheltered and scared. Although Austin gets around to being gutsy eventually, she does have lots of fears. I’d pick one of these young actresses—based not on their looks but their ability to portray vulnerability: Dakota Fanning, Elizabeth Olsen, or Sheilene Woodley. I think they are all excellent. Q: Desolation Row is set against the turbulent backdrop of the 1960’s. Why did this specific era personally resonate with you? A: Within the mystery genre, historical fiction is my personal favorite. Many authors locate their sleuths and their spymasters during the wars of the twentieth century. The two world wars and the Cold War all have hundreds of mysteries set during those times. The only large wars of last century not “taken,” not overrun with mysteries, occurred in Korea and Vietnam. The latter is a comparatively empty niche that I concluded needed to be filled with more mysteries—and I decided I was the one to do the filling. I wanted to show what life was like for young women of that era—not the type that made headlines, the Hanoi Janes or Angela Davises, but the moderates who nonetheless got swept along by the tides of history during the turbulent sixties. All that turmoil lends itself to drama, intrigue, and murder. Q: Did you do all of your research in advance or look things up as you went along? A: I had my fill of research a long time ago in graduate school and chose something I could write about without having to do lots more. If I hit something that I wasn’t sure of, then I looked it up. For example, I mention the Maginot Line and thought I knew exactly what it was, but I did research just to make sure. I was right to begin with, by the way. I also had a Canadian judge read my manuscript to ensure my portrayal of the criminal justice system was correct, and also journalist who had attended the University of Toronto read the manuscript to make sure I had the period details right. Austin Starr and her new husband David move from Texas to Ontario because he is resisting the Vietnam War draft, and they both become grad students at that university. A: I adore historical mysteries that come in series, and that is exactly what I set out to do in the beginning. I am writing the second book in the series and have the third and fourth plots in mind already. Q: How did you go about finding the right publisher and what was your experience with the publisher you ultimately chose? A: I submitted the manuscript of Desolation Row to several agents and to three publishers that would take un-agented submissions. Many American agents and some publishers are not keen to take on a book that is not set in the United States and definitely didn’t see the Canadian setting as a plus, but the publisher I ended up with had already issued books that have Canadian content. As soon as I saw that on their web page, I knew that Stairway Press of Seattle would be a good fit with my book. Lucky for me, I turned out to be right. The people at Stairway have been a joy to work with, and because my publisher Ken Coffman runs his operation like a writers’ cooperative, I had a lot of input into how my book turned out physically. Q: I love the cover design! What’s the story behind it? A: Isn’t She lovely? I get so many comments about the cover. That pleases me because I found that cover model myself. If I had been with a huge publishing house, I would have had little to no input opt for a hippie-ish looking young women. The same model used in book one will be on book two as well, naturally! Q: What do you know about the publishing world now that you didn’t know when you first started? Q: What do you know about the life and habits of being a working writer now that you have published your first book? A: I’ve learned that a writer has to do enormous amounts of self-promotion. Also that you really, really have to want to be a writer because it is not easy and is, in fact, tons and tons more work than I ever dreamed. That said, I absolutely love being a working writer, every bit of it. Well, perhaps not the ups and downs, but even the big-name writers say they have those too and that the capriciousness and anxiety inherent in the writing life are all just part of the whole package. Q: Did you allow anyone to read Desolation Row while it was a work in progress or make them wait until you were completely finished? A: I am in two writers’ groups and therefore many people had the opportunity to review Desolation Row before it came out. I found their constructive criticism helpful. Q: Many book clubs are using Skype to invite today’s authors into their living room meetings. Have you done this and, if so, what do readers need to know in order to book you for a virtual appearance? Q: What would your fans be the most surprised to learn about you? A: My author’s photo shows me holding one of my house rabbits, named Dusty. Fifteen years ago my husband and I began rescuing bunnies that people abandon. Few people know that—after cats and dogs—rabbits are the most often given up to animal shelters. I am a member of a rescue organization called Bunny Buddies in Houston and active in getting people to learn what great house companions rabbits can be. A: I’m writing the second Austin Starr mystery entitled Rainy Day Women. Austin’s only good friend in Canada becomes the prime suspect in the murder of a graduate student in Vancouver who was the leader of a women’s liberation group. Rainy Day Women is a famous Bob Dylan song, but it fits so perfectly. Vancouver in Canada is just as rainy as Seattle, plus the plot centers on women.